BUT, all that said, my big complaint about the Black Lagoon books is that they are incredibly, incredibly REPETITIVE, a trait that can antagonize parents, while, at the same time, delighting kids, apparently. If you’ve read one Black Lagoon book, you’ve almost literally read them all. There’s a kid named Hubie (love the old-timey name). He’s heard that he’s getting a new teacher, principal, school nurse, bus driver, etc, etc. He’s heard this new person is HORRIBLE. Hubie recounts all of the cautionary tales he’s heard about the person, stories derived from a kid’s humorous misunderstandings about the world around him. 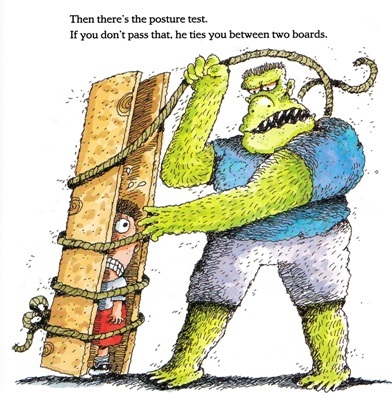 For example, he’s heard his gym teacher makes you jump over a real “horse” (instead of a gymnastics horse). His new teacher, Miss Green, is supposed to really be “green” (a big lizard lady). And his new computer teacher “bites” (rather than “bytes”). You can see where this is going. The new person enters, turns out to be perfectly normal and nice, and Hubie is relieved. End scene. There are nineteen or so Black Lagoon picture books and almost every single one of them follows that EXACT formula. There’s a riddle book and some Black Lagoon beginner chapter books (that my daughter also enjoys) that vary up the template a bit, but, as a parent, reading a Black Lagoon book feels a lot like going to a decent fast-food restaurant. You know exactly what you’re going to get every single time. Take that, gym teacher of America! And there are times when that’s exactly what you and/or your kid is looking for, and there are times when that kind of strict adherence to a set formula will drive you absolutely nuts and make you BEG your daughter to please, PLEASE pick another book for bedtime. There are nights where you can only visit the Black Lagoon so often. They’re definitely well-intentioned books, structured around showing a kid that his fears about the outside world are usually unwarranted, but do you really need nineteen variations on the EXACT same message? My negativity aside, it has to be said that Thaler does have a nice grasp of how kids of a certain age perceive the world. Hubie is a kid with an extremely deficient supply of context and watching him try to invent definitions for concepts that haven’t been explained to him can be a fun exercise. BUT, like I said, my daughter loves these books, even though I thought she would’ve outgrown them by now. They’ve been in print for twenty years, they’ve sold millions of copies, and they’re a staple at any Scholastic Book Fair. Mike Thaler is OBVIOUSLY doing something right. So, please, take my criticisms with a grain of salt. Kids truly seem to enjoy the Black Lagoon books and having some in your home library is probably a good idea. But you don’t need more than one or two. After you’ve heard one of Hubie’s tall tales, trust me, the rest are pretty predictable. AGE RANGE: The stated age range is 4 to 8. Kids younger than four can definitely enjoy them (unless they get scared by pictures of cartoon monsters), but eight might be a little old for the Black Lagoon picture books. 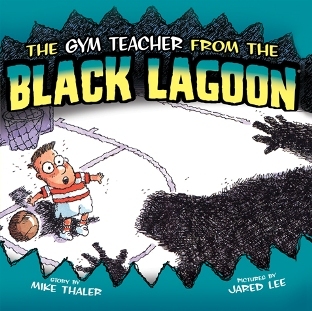 RELATED WEB SITES: There’s a Black Lagoon section on Mike Thaler’s official homepage, but it doesn’t look like it’s been updated in a while. You can also find info on the Black Lagoon series on the Scholastic website here. BUY IT, BORROW IT, OR FORGET IT? : These are very cheap books (normally $3.99), so buying one sight-unseen isn’t much of a risk/investment. But, if you can, try some out at the library beforehand and see if the Black Lagoon is somewhere your kid cares to visit first. 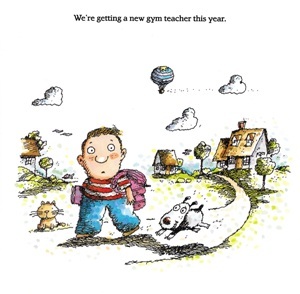 Amelia Bedelia by Peggy Parish – Amelia Bedelia is the reigning godmother of “misunderstanding” humor and, to be frank, she’s a much funnier children’s literature icon than Hubie could ever hope to be. The story of an easily-confused maid who, apparently, has no idea what any idiom means, Amelia Bedelia remains a favorite in our house, even if many of Parish’s references – like “trim the meat” or “draw the drapes” – are occasionally obscure or dated enough to go over my daughter’s head. There are a ton of Bedelia books and spin-offs out there, but the original titles written by Peggy Parish are the warmest and funniest and most worth your attention. Just want to say, I’m 16, and I also LOVED these little books when I was a kid. I guess it’s a generaltional thing. 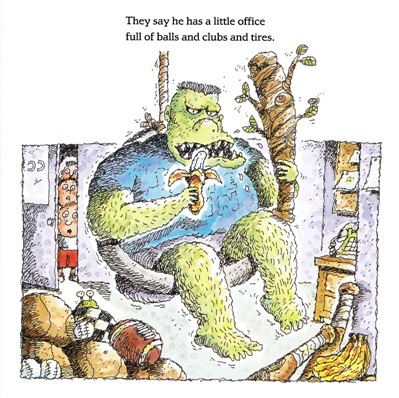 I remember being especially fond of the illustrations as well, especially Mrs. Green; mmm, big toothy draconic alligator-thing. I think my fondest memory with these books is that very brief moment of time when I switched elementary schools. I checked several of these things out of the library there. Coincidentally, my teacher also read us Miss Nelson is Missing in class. Miss Nelson Is Missing is one of my daughter’s absolute FAVORITE books! Is there a dentist book in the series? Because my son is homeschooled so he can never relate to the school themed ones! Speaking of repetitive books, my 7yo (as of yesterday!) loves the Scaredy Squirrel books. I thought the first was really funny but every one after was a variation on the same theme which isn’t fun for me, though my son adores them.